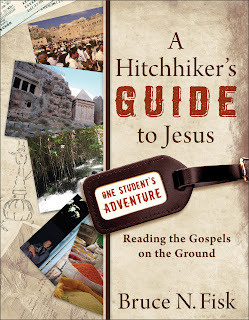 The Biblical World: Hitchhiker's Guide to Jesus: Blog Tour! Hitchhiker's Guide to Jesus: Blog Tour! Over the years I have read a number of books on the gospels and the historical Jesus. Most of them were interesting. Many were helpful and some I consult regularly when researching or preparing for a lecture. But there are few that I can recommend to students or others interested in the topic. Quite often these books are not written for the biblical studies novice. They tend to be technical works that assumes much about the reader’s previous knowledge. They are written for the author’s academic peers, not necessarily for students. 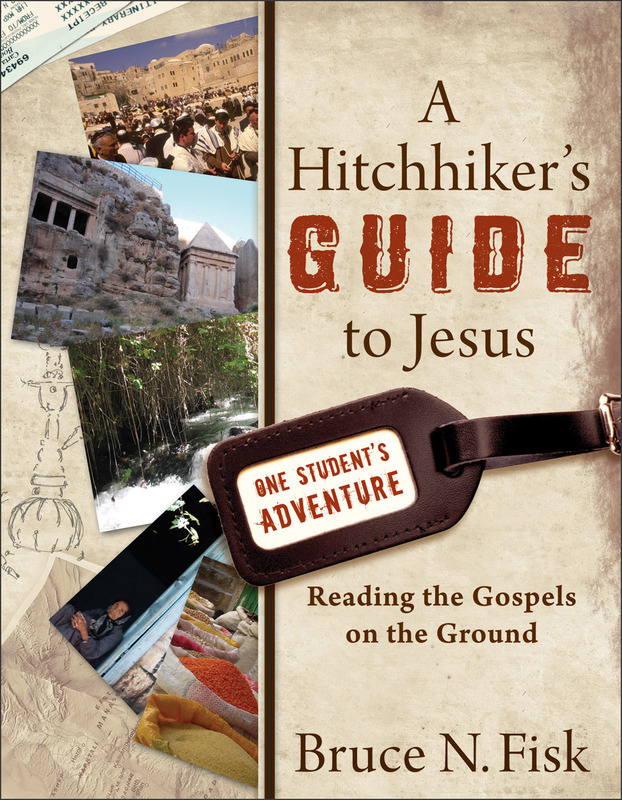 But in Bruce Fisk’s A Hitchhikers Guide to Jesus: Reading the Gospels on the Ground, I have found a book that I can recommend to my students. This is not just an introduction to the Gospels and Jesus. It is a journey and Fisk proves to be a reliable guide for the reader. I first saw the book in August at a conference in New York. I will admit then when I looked it over while standing at the Baker book table I did not think it would interest me or my students. I thought it looked a bit “quirky” with too much attempt to appeal to a younger audience. But I now admit that the genius of Fisk’s book is that it looks and reads like no other textbook you’ve seen. Instead of being a book with chapters on methodology, sources and historical criticism, Fisk takes the reader on a trip to the holy land with Norm, a recent college graduate, who has had his first critical introduction to the gospels in college and is trying to piece together what he thought he knew about Jesus with what he has learned. The stage is set in the first chapter when Norm boards a plan for Israel to see the land where Jesus walked and to see what he can learn. On the plane Norm encounters a woman who is curious about why Bruce, (eh, I mean Norm) is reading the letters of Pliny the Younger. This becomes an opportunity for Norm to explain to her, and the reader, about some of the ancient sources for Jesus and Christianity outside of the New Testament. Quotes from Pliny, Tacitus, and Josephus are interspersed throughout the chapter resembling little sticky notes or torn pieces of notebook paper scribbled on and used as bookmarks. The presentation of the material in this format is brilliant because the reader is learning about the history of early Christianity and the sources for that history. And it is all happening as part of a conversation between Norm and his fellow passenger as they fly to Israel. And the journey continues this way chapter after chapter as Norm meets new people and wrestles with new questions. The day I sat down with Butlmann’s History of the Synoptic Tradition was like the day Neo took the red pill. It yanked me out of my comfortable matrix and thrust me into the harsh world of biblical criticism from which, it seemed, there could be no return. (p. 15). This line not only describes the impact of Bultmann on New Testament studies, but the feeling that many of us had when we were first introduced to the critical study of the Bible. Along the way readers are introduced to other scholars of the New Testament, many through quotes on “sticky notes” in the pages. But the most engaging section for scholarship is the dream sequence in which Norm goes down a long corridor knocking on doors and meeting Jesus scholars such as John Meier, James Dunn, Scot McKnight and others. I won’t spoil it for you, but besides epitomizing nicely what these scholars have said about Jesus, Fisk also does a good job of characterizing them. If you know any of the people described here you will now that Fisk has described them and their work well. One thing that not only makes this book standout from others, but also interesting, is the way Fisk has woven in details of the places in the holy land where Jesus lived and ministered. Norm visits the various tourist spots in the holy land (Israel, West Bank, Jordan) and views the story of Jesus in its geographical and archaeological context. Fisk does a good job of describing the sites, their historical value and any problems related to them (like the Via Delarosa being the supposed road Jesus walked to be crucified). But Fisk is also careful not to overlook the current events in the Middle East. He not only acknowledges the complexity of the Israeli/Palestinian conflict, he integrates it into his story suggesting at times that there are parallels to be found in the story of Jesus. Finally, what also makes this book unique, as well as useful, is the honest way in which Norm is allowed to wrestle with the tension between faith and history, between fact and tradition. Fisk does not duck the questions that historical inquiry raises about Jesus and the gospels. Through Norm, he thinks out loud about the implications of a faith that is not always able to find the security of historical moorings. He doesn’t provide any easy answers. Readers are given the materials they need to work with, but they are left to wrestle with the answers for themselves. I think this is the way it should be. The book teaches through the story of Norm seeking to understand his faith. And, in some ways, it is like the gospels which teach us the story about Jesus. As I said in the beginning, this is a book that I did not think would interest me, but I could not put it down once I started it. Although I was already familiar with much of the material, I found it be a different and enjoyable way to interact with it. I would have thought it only appropriate for undergrads, but am now convinced that it will be valuable for my seminary students as well. I not only recommend it to you, the readers, but will adopt it next time I teach my class on the gospels. *Don't forget to enter the contest at Baker (see to the left). And check back Friday when the Friday book giveaway will feature a copy of Fisk's book. Also, click the image below so you can read reviews by other NT scholars this week of the blog tour.